The largest Marine Corps base in history, the Marine Air Ground Task Force Training Center at Twentynine Palms is located on 930 square miles of harsh terrain, nearly the size of Rhode Island, in southern San Bernardino County. An army base for training glider pilots at the outset of World War II, the former navy facility was taken over by the corps in 1952 during the Korean War and the advent of the cold war. The base provided adequate space and ranges to test new artillery and missile technology and was ideal for the largescale training of ground forces. 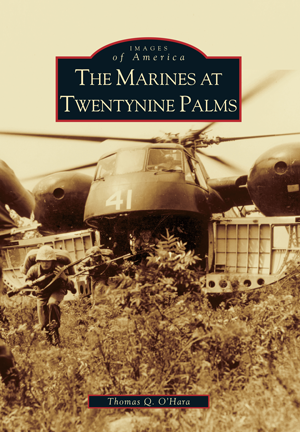 In the 21st century, every U.S. Marine does a stint at Twentynine Palms because the climate, terrain, and remote location simulate many international hot spots of world strife. The marines have continually upgraded and expanded the Twentynine Palms facilities as daily maneuvers involve transports, tanks, artillery, and aircraft, particularly at the Expeditionary Air Field. A retired Marine Corps colonel and pilot, Thomas Q. O'Hara is the author of the Images of America books Marine Corps Air Station El Toro, Camp Pendleton, and Marine Corp Air Station Miramar. He is the aviation historian for the Flying Leatherneck Aviation Museum (FLAM) in San Diego.